It's been quite a while since I've tried my hand at a tablescape. My first one, which I named, Mangia Mangia, was back in July 2010. I would like to welcome you to breakfast with Snap, Crackle & Pop. The Rice Krispie plates came from TJ Maxx a few years back. I used my everyday white dinner plates & mugs, along with my everyday Oneida flatware. I'm linking this at Susan's blog Between Naps on the Porch for Tablescape Thursday. Thanks for stopping by. The weekend is almost here! And just because I can't resist the urge to complain a little...it is snowing right now. Ugh! OMG that is so cute Gina! !~ Love the plates. How fun is this!!!! Love it! I love it Gina, those plates are so cute and also love the Fiestaware, everything is adorable! You're welcome! Nantucket White is an awesome color btw! I've used it too! You always have the cutest things! Those plates are to fun! Snow is seriously melting here! I'm praying we don't get anymore snow but it's the Arctic. Ugh! Go away already. I'm all happy seeing dead grass right now. lol. Hi Gina, love your snap crackle pop--brings back memories of childhood!! So adorable--I know what you mean, I complained about the weather being in the 50s! If we had snow, I'd have to complain LOUDLY! Thanks for visiting me and your kind comments...keep those tablescapes coming, your family will get used to it. Mine still thinks I'm crazy, but what else is new lol!! What a cute and fun tablescape Gina...I love it! Oh, well see, now you have me craving me some Rice Krispies. Hee, hee, hee :-) Have a wonderful day my friend. That is absolutely so fun and just too cute!! Cute, cute breakfast table, Gina! How could your family possibly resist such a darling table??!?!?!! Don't worry...they'll get used to the idea of you setting the table for them in due time. Pretty soon they'll be critiquing your work, putting in their own 2 cents, wondering aloud why you're repeating a particular motif...they get sucked in pretty good after awhile! :-) Since you haven't put up a tablescape in several months, you've come back around at just the right time. I hope you'll visit my blog to check out details of the Mikasa Giveaway I'm hosting. You could win a 5-pc. place setting for six of Mikasa's "Daylight" pattern. It is beautiful and really versatile for spring and summer. All you have to do is enter your best Spring tablescape. C'mon...do it just to irk your family! :-) Seriously, I hope you will check it out and enter. Easy way to score a set of fabulous Mikasa china! 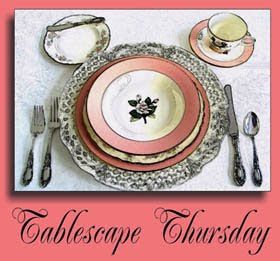 Good to see you here (I didn't join Tablescape Thursdays until September 2010), and I hope to see you again soon. Have a great weekend! Very cute table Gina! Thank you for stopping by my blog. And you noticed that the photos were taken at Hart's Hill :-) I'll stop by again! Have a good weekend, and I wish it would warm up. Gina, that is such a cute table. Keep on setting! Your family will eventually get used to it. LOL. I see you have some scarlet Fiesta on your table, too. My favourite colour of p-86. But I love that you did a Snap, Crackle, Pop table. That is my favourite cereal and I have collected a lot of vintage ads of Rice Krispies with Fiesta and Harlequin. Looking forward to seeing more of your creative tables! Oh I adore your SC&P tablescape~ swoon! This is so wonderful! I just love those guys! Great tablescape! How cute this is. Love those darling plates -- The different napkins compliment so well. I love all the colors of your tablescape! Those plates are so fun and cute!